If you want it to look festive then you just hang your twinkly lights around it. However, if your trying to produce a top quality image to use on your Christmas cards, or in a festive advert, then the answer is not quite so straight forward. With the tree in the studio all set up for the Christmas Portrait sessions, I thought I would take the opportunity to take a few stock images and create a card that I can send to my customers. In this post I thought I would share how I achieved the image below. My aim was to create a low key, classic style image that looked like it was lit, by a celestial body, from above. To make sure I captured as much detail as possible I relied upon the Pentax 645Z. With it’s 50Mp Medium Format sensor the level of detail is astonishing. If you interested in seeing what I mean just click on the image and you can view the file full size. To create the right effect I needed the tree against a dark background. However, I had already started off with the tree against a white backdrop because I also wanted some high key versions for uploading to the stock agencies. Planning ahead I knew that by careful placement of lights a white background can be any shade of grey and even black. Capturing the tree lights was essential as well as ensuring that shape of the tree was accentuated. To create the correct lighting effect the lights were added, and adjusted, separately. Firstly I set the camera to expose the image by just using the tree lights. This meant that I needed a longer shutter speed and virtual total darkness. Fortunately I designed the studio so that I could completely control the lighting right down to virtually nothing. Exposing for the tree lights gave a natural shadow pattern on the floor and backdrop. However, as you can see, much of the tree and presents are in darkness. Although this can be recovered in post, I prefer to get it as close to the final image in camera. Next I added a side light. This was diffused through a strip softbox to create a subtle edge light down the left hand side of the tree. This created a slight 3d effect. The softbox was gridded to ensure that there was a minimal effect on the floor and backdrop. I now needed to add some subtle highlights to pick out some key details. Firstly the Father Christmas figure on the top of the tree was lit with a gridded strobe from camera right. This was positioned to balance with the edge light and was focussed purely on the small figure. Again it was positioned to ensure minimal impact on the overall lighting and to avoid shadows on the backdrop. 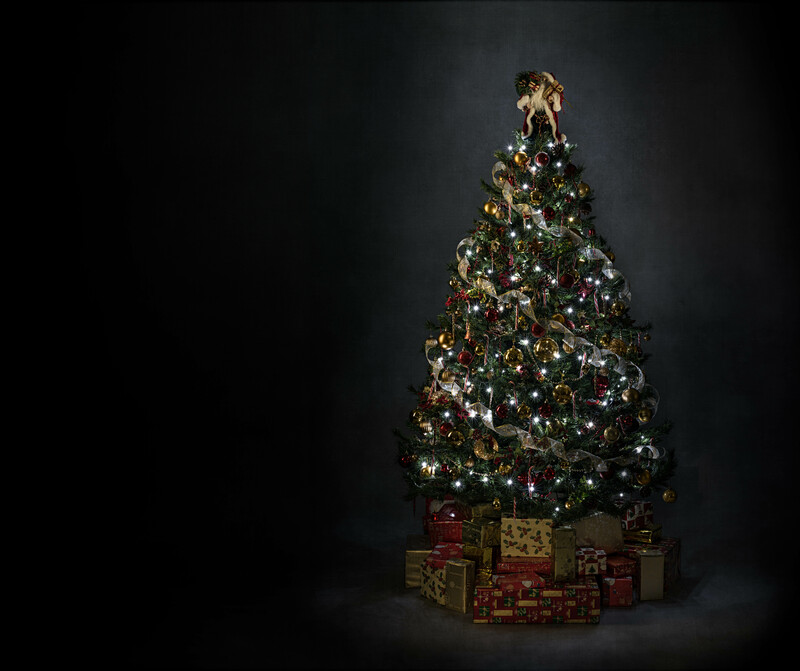 Lastly a strobe, fitted with a snoot, was positioned below the camera to add a small area of light on the presents at the foot of the tree. Again the aim was to add a subtle light without impacting the overall scene. The final lit image was imported into Lightroom and lens correction applied. Then the white balance, shadows, highlights, clarity and sharpness were adjusted. Following this it was opened in Photoshop where the cable was removed, background extended and textures added. The gold and red colours were enhanced and a few extra tree lights were added to fill in some of the gaps as well as creating the overhead light effect. All in all I am happy with the final result. Hopefully this post shows how attention to detail and small incremental steps in lighting can create an overall effect. It should also show that the post processing of an image can be just as important as the preparation and capture to achieve a desired effect.